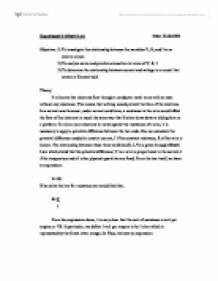 Investigate the relationship between the variables V, R, and I in an electric circuit. The resistor is remove the next one used is chosen. The voltage is recorded in Table 1 as in step 5. The process is continued until all the resistors’ voltage recorded. Three resistor of the same value is chosen. The set of colours is recorded in Table 2. 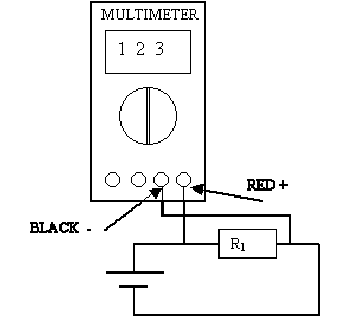 The multimetre is used to measure the resistance of the three resistors. The value is then recorded in Table 2. The three resistors are connected to the series circuit by using the spring clips on the Circuit Experimental Board to hold the leads of resistors together without bending them. The resistance of the combination is measured as indicated on the diagram by connecting the leads of the Multimetre between the points at the end of the arrows. A parallel circuit is constructed by using the combination of the two resistors and finally by using all the three resistors. The values for the circuits are measured and recorded. As a conclusion we can say that the data obtain in the experiment obey the rule. In part 3, we found out that the voltage gets distributed in a series circuit with equal resistance when the value of the resistor is the same. The larger the value of the resistor, the larger the value of the resulting voltage. In part 4, a voltage versus current was obtained. At a certain point in the graph, a straight line is obtain which directly prove Ohm’s Law which stated that the voltage, V is proportional to the current, I and the slope of the graph is the resistance. 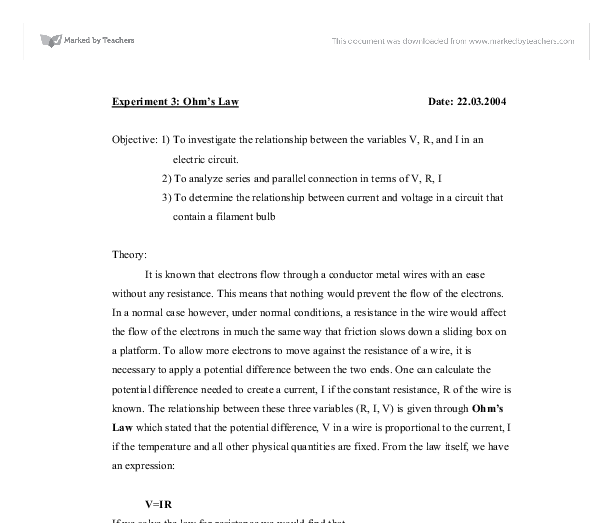 Find the relationship between the current through a resistor and the voltage across it. For different wires, there is a different amount of resistance. The thinner the wire the higher the resistance there is if the temperature and other physical conditions remain constant. The resistance would remain the same, for each wire, no matter how EMF is supplied.